AUGUSTA, GA (WKBW) — Tiger Woods is not the only comeback story at The Masters. Valentino Dixon, the innocent Buffalo man who spent 27 years in prison on a wrongful murder conviction, spent the weekend at Augusta National to showcase the drawings that got his conviction vacated. Dixon's audience included the greatest golfer of all time, Jack Nicklaus. Inside one of the club's buildings, the pair hovered over Dixon's numerous, intricately detailed drawings of golf courses where Nicklaus won major championships. "I don't know how to golf, I've never golfed before," Dixon told Nicklaus. "Doesn't make any difference," Nicklaus said, complimenting his artistic talent. Dixon told Nicklaus about his murder conviction and how, during his time in prison, he became captivated by images of golf courses that he saw in issues Golf Digest magazine. Nicklaus, clearly moved by Dixon's palpable positivity, compared his story to that of Nelson Mandela. "You know, I always go back and look at Nelson Mandela, who I had the privilege to meet on several occasions. "He came out [of prison], didn't have any malice, he loved his fellow man, he was such a great leader for South Africa and what he did. And I know, I have a great respect for Nelson Mandela, and for you," Nicklaus said. Nicklaus could not have possibly known that hanging on a hallway wall in Dixon's Buffalo home is a portrait Dixon drew of Mandela. "It was excellent, out of this world," Dixon told 7 Eyewitness News Anchor Ashley Rowe about his experience. 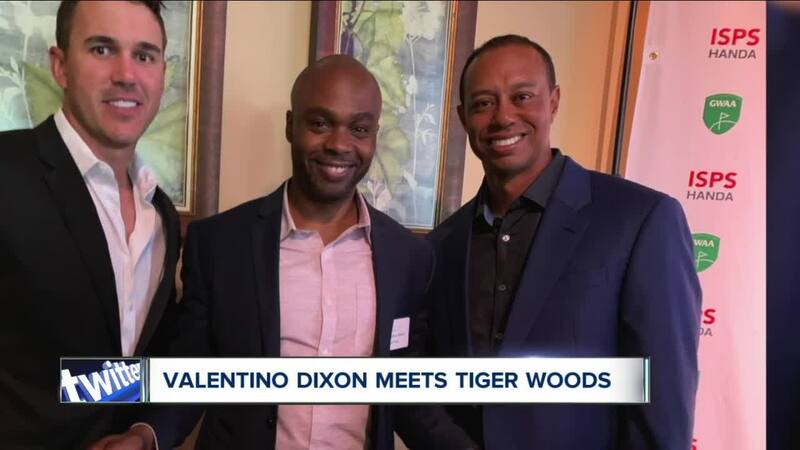 Dixon was an invited guest at The Masters by Golf Digest magazine writer Max Adler, whose extensive coverage of Dixon's story led to his prison release in September 2018. A week after his murder conviction was vacated, 7 Eyewitness News brought Dixon to a Cheektowaga golf course - his first time ever setting foot on one. Six months later, Dixon would be getting golf lessons from eight-time Major Championship winner Tom Watson. But the highlight of his trip to Augusta was undoubtedly meeting the man who has had a remarkable comeback himself: Tiger Woods. "He asked me how I go through the process of how I do a drawing," Dixon said. But that's not all they talked about. "[Woods] says, 'I'm going to do my best'. I told him, 'No, you're going to win that tournament'."